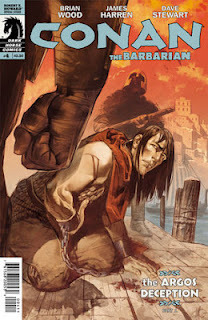 The Fellowship was fortunate enough to obtain a copy of CONAN THE BARBARIAN #4 from Dark Horse Comics. Brian Wood writes, and James Harren is the artist. Conan is free, he’s got a woman who loves him, and he couldn’t be happier. His pirate crew has a plan, though, that has him walking willingly and knowingly into a trap from which he might not escape in time. The plan is counting on bureaucracy, but when it fails, can Belit and the crew save him? This issue begins a new arc, and it also climbs into the mind of a young Conan. It’s hard to imagine a Conan filled with doubt and fear, but I think it works. It certainly makes him seem real, and it also shows a feeling side to the barbarian—he seems to truly love Belit and despairs of life (or death) without her. This gives the story a dramatic style rather than the usual epic style, which I like as a change of pace. And the art is beautiful, especially the larger panoramic scenes. This story could really give us a chance to get to know Conan, as opposed to just following his exploits. I like the possibilities in that idea, and I look forward to where this arc takes us. CONAN THE BARBARIAN #4 is available now at your FLCS or by order from darkhorse.com.